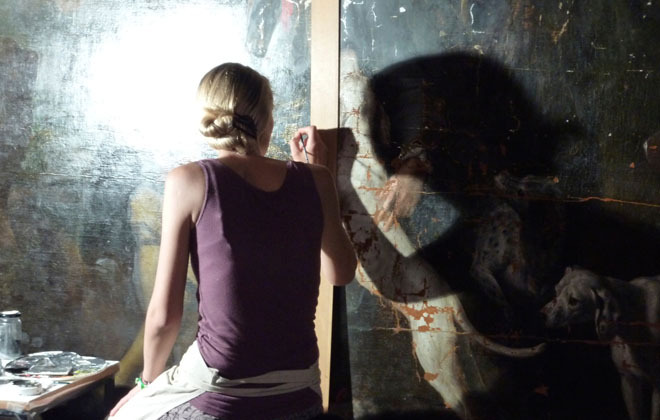 When I was in Munich touring the famous Nymphenburg Palace, I had the good fortune to witness firsthand the art of painting restoration on a piece the Palace had recently acquired from a private owner. I stood there mesmerized for quite some time watching this woman meticulously work away at a tiny area of this immense painting. Really loved that she was set up right there in the middle of the palace for anyone interested in watching her work or just to follow the progress on this piece’s restoration efforts. It felt like such a treat to turn the corner and see this mastery in action. I realized how huge a task this restoration work is and how important of a skill this is. Imagine if we couldn’t restore paintings back to their near-original state? Wikipedia considers it both an art and a science which really is true when you think about it. Watching her work as I did really highlighted both those qualities. I cannot imagine how hard it would be to do this. What if you make a mistake? The painting of a former Bavarian crown prince, Karl Albrecht, is considered an important piece by a prestiged French portrait artist, Joseph Vivien, who was a court painter for many years. The prince is in hunting dress surrounded by his hunting dogs and accompanied by his stable masters and dog handlers. The painting dates back to the 1720s and had been reworked at least twice before. It will take more than 2500 hours of work to restore this painting. I look forward to revisiting Nymphenburg Palace one day and seeing this painting hung in the gallery there in all its newly restored glory. When I do, I will let you know how it looks and share another update. She still has quite a bit to restore as you can see from this shot.